4-H Stories from the Heart presents inspirational and heartfelt stories by 4-Hers, volunteers, and staff that will inspire, amuse, and bring back fond memories. For more than a century, the 4-H movement has touched the lives of millions of people, one experience at a time. You will read how over 60,000,000 people have learned to step up and lead in a complex and changing world. Don Floyd, Preside… nt and CEO, National 4-H Council Reading these 4-H stories will warm your heart, help clear your head, remind you why we extend our hands to serve, and yes, provide you with healthy, wholesome laughter! These stories resonate and capture the essence of 4-H. Lisa Lauxman, Division Director, 4-H Youth Development, NIFA USDA This is an amazing collection of stories from all across the country. Some of the stories may sound familiar, while others will be new and unique. But all of these stories will touch your heart. Earl McAlexander, President, National Association of Extension 4-H Agents In a little over a century, 4-H has evolved from a program primarily designed for training rural youth in new agricultural technologies to the worlds largest youth development program. The 4-H experience creates amazing tales best told by those who lived them. 4-H Stories from the Heart offers a wide variety of stories by current and former 4-Hers, volunteers, and professionals; some as young as six years old and others eighty plus! The stories are sometimes funny, sometimes poignant, and often inspiring, but they all come from the heart. Learn how a teacher from a poor Mississippi school district leveraged a $1,0004-H grant to enable her students to change their world. Chuckle over Horse Vandal Strikes at the County Fair, Banned from the Barn, and Manure Happens. Discover how a dead chicken helped win a poultry contest, and why a new 4-H agent told his 4-Hers to steal canes from old folks. 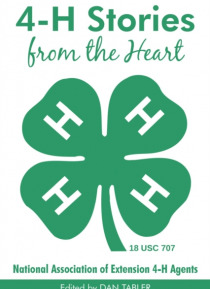 4-H Stories from the Heart is a project of the National Association of Extension 4-H Agents. Proceeds will be used to create an endowment for the National 4-H Hall of Fame that recognizes and celebrates those who have made a significant impact on 4-H from local to national levels.